Figure 1: Google Ecosystem Overview... it's even bigger than this picture undertakes to show. Earlier this week, we discussed digital life ecosystems and how to identify which is likely best for you. Today, I'd like to cover the main ecosystem components I think set Google heads and shoulders above the rest... for now! My apologies to those for whom that earlier exercise pointed you to Apple or Microsoft. Hang tight, I'll likely get to MIcrosoft in the future. Apple? Probably not. I believe email now and always will be the core communication vehicle. This has been Google's approach to social from the beginning and I believe in the end this is why they will win the "social battle". Email provides for communication of more content in a richer fashion including attachments. Emails can be large or small such as in notifications. This brings me to a main point about your Digital Life Ecosystem (see Figure 2 below). If you plan on living on your social network page / app all day, every day, then having social as your Center of Influence may make sense, but how practical is that? Living on the stream means it rules you, not the other way around. Instead, any social network and indeed any service you use, should come to your beck and call in your email inbox! Figure 2: Digital Life Ecosystem. What's the center of influence of your Digital Life? In other words, where's the one, first place you go to really get caught up on your digital life? Gmail is a great interface increasingly customizable to meet exactly your needs. Google excels in search and nowhere do I appreciate it more than in email. If you're afraid that it seems too different, sign up for one anyway and just play with it for a week to get the "feel" of it and I think you'll find, as I did in such an experiment, there was no going back to Outlook for sure and even Hotmail and Yahoo seem oppressive after Gmail. Even your voicemail and your texting can and as far as I'm concerned, run through your email. Transcripts of your voicemails can show up in your email. You can provide customized greetings for groups or individuals to improve your relationships be they business or personal in nature. 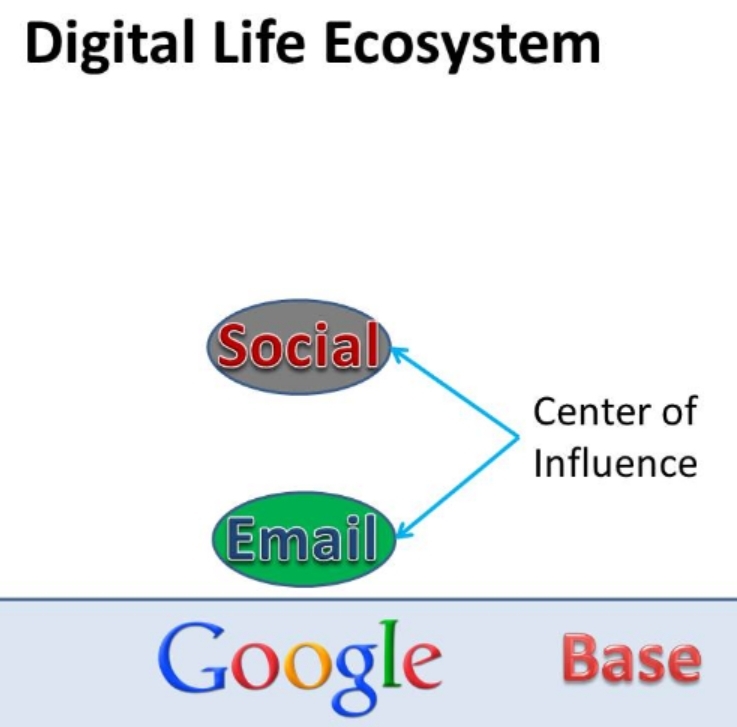 As mentioned above Google's approach to social believes that your email is the center of your digital social life. Your contacts / address book is something you already have and should retain control over. Facebook effectively holds your contacts hostage. Review this article from May this year and see that you can only export the Facebook contacts for friends that permit this. This is just strange behavior. My friends have no problem giving me their contact information. I filled my personal address book by just asking them. I don't need to and certainly wouldn't ask them to lower their security on Facebook by making their contact info public! My address book is MY address book and I should have complete control over it. Google provides this not only for Gmail usage, but Google+ uses my contacts natively with my Google+ Circles and vice versa. Google+ is also just easier to use and much less cluttered. Check out these shots of my Facebook and Google+ page today. They are the same resolution in the same browser set to the same "zoom" level of 100%. Google+: clean, large type, good use of space. 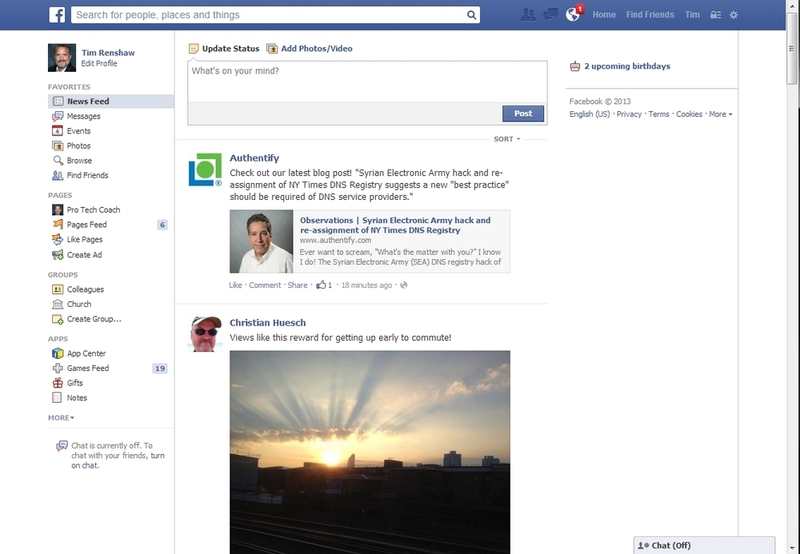 Facebook: cluttered, tiny print, wasted space. As you can see I do retain a Facebook account, but primarily to post ProTechCoach content to. I'm not blind to the fact that FB is where most people still are. However, everyone I've introduced to Google+ that has given it a shot has moved to it. Regardless, per my content above, email is still how I interact with both sites and can do so more quickly and powerfully with Google+. Hangouts has morphed a bit from being focused on video to serving as a central IM with video capability. All of this is exposed within both Gmail and Google+ as well as having standalone apps on the desktop and mobile. This is the essence of a good ecosystem. Everything integrated and available where it makes sense and / or as you prefer it. Maps are great in a browser, but where it really comes into its own is on mobile where you really need it. Not sure of the best way to get to a friend's from where you are? Pull up their contact information, click their address and Maps opens up to provide you turn by turn directions! Happened on a great little eatery not on your normal path? Open Maps and store it for future reference, while also reviewing and sharing your new find with your friends! I'm continually amazed how little people know about this function. Create, store, share and collaborate on your documents with colleagues, friends and others in your social circle. No need to have MS Office on any device! Save money and make yourself more productive. Check this out today! No surprise that the Google Ecosystem works particularly well within Google's browser. Sign into Chrome with your Google account and your bookmarks follow you to any Chrome browser on any PC or mobile device you encounter through the Chrome browser. Did you not get to an interesting article on your PC and now you're on the road with your phone and would like to read that article? Quickest way is to open the tabs from your "other devices" and get the link without even having to search for it! Lots of handy extensions for +1ing articles, sites, etc. to your Google+ stream and accessing Hangouts, etc. Also lots of handy extensions and even browser apps for your favorite sites such as Evernote, DropBox, goo.gl URL Shortener, etc. This is just a quick run through of why I believe the Google Ecosystem is the best one going at this moment. If you have any questions about any of these features or want some help in finding something I've mentioned here that isn't obvious to you, please let me know via email or Google+ or if you have to, Facebook <grin>! Also feel free to educate me as to why you feel another ecosystem is superior.